Our bird wind spinner features a hand painted metal bird perched on a stake with a yellow spinning tail made from real feathers. The feathers spin in the slightest breeze and defy all types of elements. 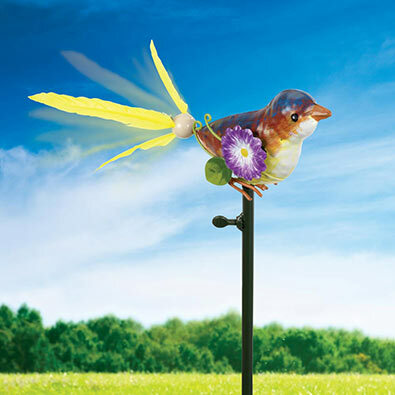 Embellished with a whimsical flower, this adorable bird adds color and motion to your garden. Charming placed in a potted plant. A cheerful addition to any garden. Bird measures 3" x 8" on a 33" enamel metal stake.